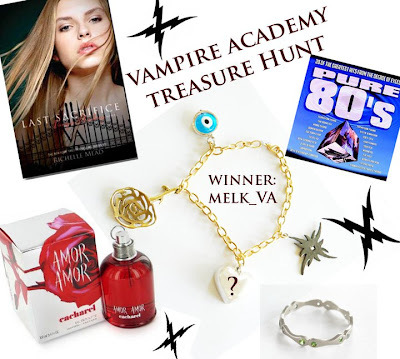 After a weekend full of excitement, of course with teasers, but mainly the Vampire Academy Treasure Hunt, organized by Janet Cadsawan, I was going to say we can take a breath and relax a bit. However, it will be a short rest, which is also fun seeing as it's due to the release date for Last Sacrifice soon approaching. This is the amazing booty that the randomly selected Mel won, posted by Janet on the Cadsawan Facebook page! The question mark is the Dimitri charm that isn't available yet. And I think #10 and 11 might be the girls from Lildhampir.com. Is that right? Are any of you on the list? :D How many of you finished the treasure hunt?